New Colour trim for Renault Twizy | What Car? Renault has added a new mid-spec trim to its Twizy electric vehicle range. The two-seat Twizy now has a Colour version that sits between the entry-level Urban and top-spec Technic trims. 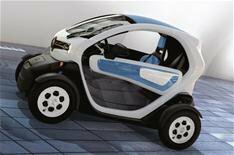 The Twizy Colour costs from 6950 260 more than Urban versions and comes with white bodywork and a choice of blue, green or orange panels for the roof and sides. Buyers can also opt for black bodywork with orange panels. Colour-coded alloys are a 350 option, while matching half-scissor doors cost 455. Renault charges 40 a month to lease the Twizy's batteries; based on a three-year loan and 4500 miles a year. See the Renault Twizy and many other electric and range-extender cars in action here.